I may well be biased, but millinery has the power to transform, whether it is a fascinator, a large brimmed hat or something in between. Whatever clothes you are wearing, if you have a hat you can look incredibly well turned out, it attracts attention and compliments like no other piece of clothing. On the other side of that though, for those very reasons if you aren’t used to donning a headpiece, choosing and wearing a hat for the first time can be a really daunting thing to do. So where do you start? What are the rules surrounding hat wearing, and how do you choose something that is just right for you, and the occasion? Start with the rest of your outfit first. Work out what you will be wearing and then you can sort out the accessories to coordinate. Lots of ladies like to have hats, bags and shoes to match, but that is becoming less common nowadays with so many possibilities to play with. In fact, having your hat ‘matching’ any part of your outfit isn’t necessary at all, you could go for a complete contrast, a blending effect with different tones or even something completely out there on top, like one of my range of Quirky Fascinators! If you have a long face like me, then a fascinator, saucer hat or button hat worn on the side can help to balance out the length. If you have quite a square jaw, go for a larger hat or fascinator to soften your face. If you are very tall, go for a headpiece with width rather than giving yourself even more height. If you have an oval face, congratulations, you can wear just about anything as far as hats shapes go and it will look great on you! If you are not very tall at all, then this is a chance to give yourself a little more height, but don’t be tempted to go too big, keep it in proportion! If you are going to a wedding or similar occasion where there will be lots of photographs, choose a hat where your face can still clearly be seen so the bride and groom will know who you are when they’re looking over their photos in the future! Also give a thought to all those hugs and kisses you’re going to want to give and avoid huge hats that are a health risk to those you’re close too!! 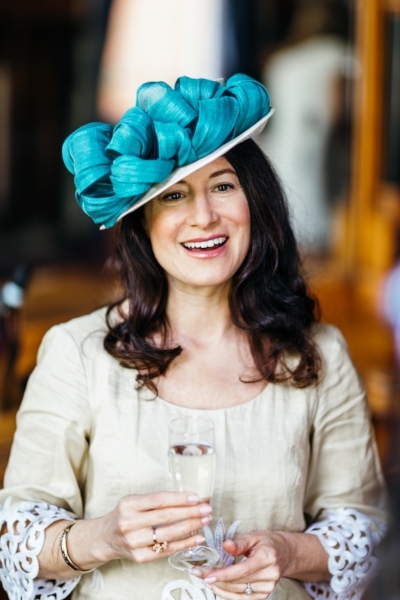 If you’re going to be a guest at a wedding… try not to upstage the bride by going too ornate with your hat! Up until fairly recently, we would have dedicated hat shops to help, guide and advise us in the process of buying headwear, but generally right now they are few and far between. High street shops often have a small selection of millinery and it’s always good to go in and try on different styles but do remember even if the particular ones you try aren’t comfortable it doesn’t mean you won’t find one that is comfy and secure to wear for your hair type. If you’re local to me here in Birmingham, you are more than welcome to make an appointment and come to try on different styles to see what you like the best, and what suits you. If you’re not so close, but still confused as to what to wear, then, by all means, get in touch and by Skype or even with photos and email, I will be very happy to help. So you’ve decided to go for a fascinator or percher style headpiece, but how do you wear it? They seem to balance at that amazing angle at the front of the head, but how do they stay there?! You now have your final choice to make, and that is exactly to decide how you will wear your headpiece. Comfort and confidence is key for hat wearing, so I want to make sure that you will be able to enjoy hat wearing by having the right fixing for your hat. Headbands are a very popular option for the smaller fascinators, especially for anyone wearing a headpiece for the first time. For fascinators I use thin metal headbands in gold, silver or black, so you can choose the best colour to blend into your hair. Once you put it on, you can simply brush your hair over the top of the band to help it camouflage. The metal bands are pliable, so they can be bent to fit securely and comfortably for you, avoiding those awful headband headaches you can get from an ill-fitting headband. I also create custom-made headbands for the percher style hats, for anyone who doesn’t like, or can’t wear the elastic option. This is a structure I create from cotton-covered wire, and then dye it to blend in with your hair colour. Combs are commonly used for the smaller fascinators with flat bases, and the decorative comb style for brides and bridesmaids, or anyone if fact who will be having an up-do for their event. I have never been able to go for this option, as I have bobbed, quite fine hair and only a professional would be able to get it to stay in all day and then it would still be a challenge, I fear! But if you have a good head of hair or have a hairdresser to help, then this can be a really comfortable and effective way to wear your headpiece. Elastic is the most common option for the percher/button style hats and headpieces. The percher hat sits at the front of your head and the elastic goes around the back so you have a perfectly balanced style. You can also use kirby grips if you wish to really secure it in place. It is easiest to hold the percher where you want it to sit with one hand, put the elastic around your head with the other hand, and then arrange your hair over the top until the elastic is well hidden. There is a selection of colours of elastic to choose from, but if you have blue, pink, green or another unusual shade of hair colour then please do contact me and I can dye the elastic for you! I hope that helps and if there is anything else you would like me to explain or cover in more detail please feel free to contact me and I will do my best to assist you!